To the outsider, Delhi seems like the perfect mingle of all the good things. 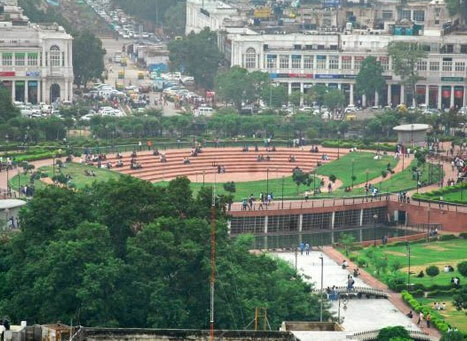 But ask those who get puzzled around the roundabouts of Connaught Place or the ones who are racing against the clock to catch their metro from Rajiv Chowk but never get a chance to sit back in one of the most loved parks of Delhi, Central Park. As the name suggests, the park is righteously etched to the Connaught Place market and is a famous cultural hub of the city. The park was renovated in the year 2006 and was bestowed upon the public of Delhi with even beautiful fountains, water bodies, an amphitheatre and a crisscrossing pathway that connects every part effortlessly. Besides, a major attraction of this park is the flag that sways in the air and was hoisted on 7th of March, 2014 as the largest flag of India at a whopping height of 207m. When the travellers get tired of shopping and walking around the huge market of Connaught Place and Palika Bazaar, they are often seen here relaxing and spending some time with their loved ones. The soothing environment of the park, where trees are swinging along the wind provides a much-required relief and inspirits positive energy. Furthermore, Central Park is also a hub for various cultural activities that keep on taking place often and brings a lot of people together to celebrate uniqueness. Rajiv Chowk is the closest metro station to Central Park. The metro exits of this station that falls on the Yellow and Blue Line of Delhi Metro give an easy access to the Park.